← Happy Retirement to Brother Caesar and Brother Al! Happy Retirement to Brother John! 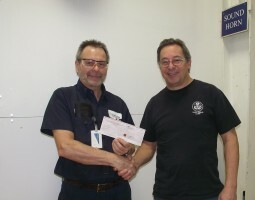 Brother John is shown accepting a retirement cheque from Local Lodge 905 President Dave Thompson. Brother John Dorsey is retiring after 26 years of service at the Ajax plant. John had served as the Secretary Treasurer of the Local Lodge. Happy Retirement Brother John!